How Much Does Cost To Make A Quilt? To make a quilt is something that will bring a smile in your face for life! You can be sure of it! I can’t find a different way to describe that feeling you get deep in your heart when you finish your first, second, third and your very last quilt. 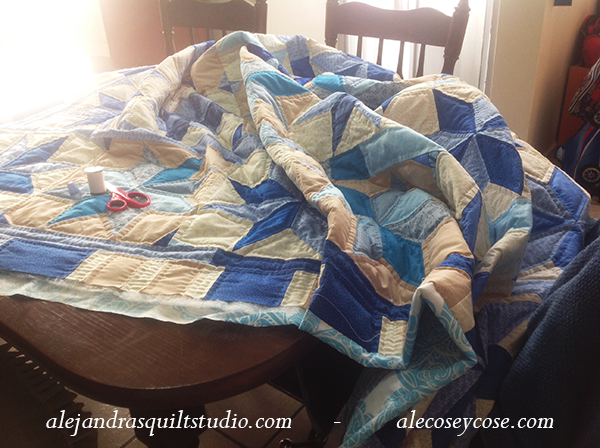 It doesn’t matter how big a quilt is, you will enjoy it since the first stitch to the last one. 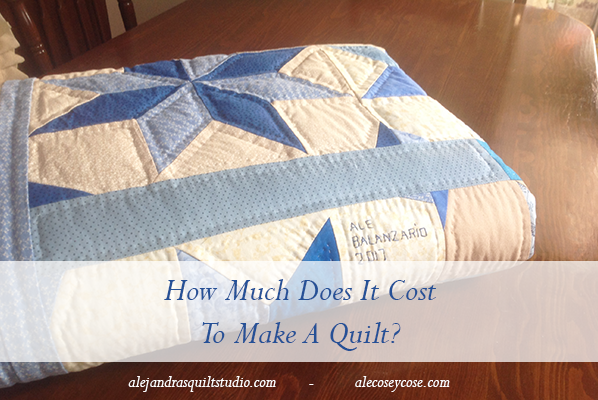 But… how much does cost to make a quilt? Yes, I know, lots has been said about how costly these quilts can be, and sometimes it has been misunderstood that only people with lots of money can make them. I’m not a wealthy person, but I have found the way to keep making my quilts. I have always thought that anyone who wants to make a quilt, can make it, and there’s many ways to find the best way to afford to make one. You can find quilting fabrics from 3, 8, 18 to even 30 dollars per metre or yard. I need to say the true here, I love each one of the quilting fabrics I see in the store, it’s hard for me to pick one from the others, and I also suffer of fabric addiction. I remember the first time I visited Canada and my husband took me to visit a fabric store here, I couldn’t believe what I saw in there, lots and lots of different fabrics for quilting with a bonus that day, the whole store was 50 % or even 75 % off the regular price. I could get lots of fabric for only 100 dlls!! Today’s fabric prices is higher. But when I’m thinking on my new quilt, I bet to think on the design and quality of the fabric and price will stay in second place, if I’m going to work on a big quilt, I take my time to save some money to afford the cost of the fabric and will not buy low quality fabrics to work with. Buying high quality fabrics will help my work to last in time. How much fabric will you need to make a quilt? It will depend of the size of the quilt you have in your mind to make, and also you need to think on the design you will be working on. 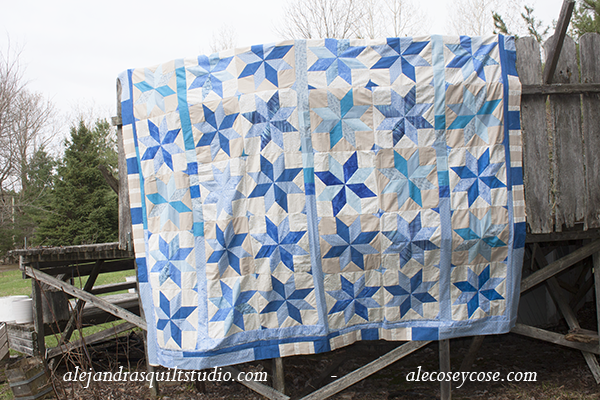 As you know, I just finished a Blue Quilt King Size with stars on it, as I was working on it, I wrote down every dollar I spend on it so I could share this information with you. Once I knew what design I wanted to work on, I also knew what color of fabric to buy, so I went to visit the store, one once but like three times, in total I spent 400 dollars to make the top. When I got the fabrics, before to think of starting to sew with them, there’s some work to do, as you might know by now. Wash, iron, and cut each fabric. Then it came the time to sit down and start working on the top. As I have told you in my previous post, I don’t work on my quilts all day long as I used to do, now I have found if I set a goal of work on a quilt for one to two hours every day, I can finish a quilt faster than if I work one whole day to work on a quilt and I never come back to work on it for weeks or months. It doesn’t matter if you do your quilt for yourself or your family or you make a quilt as a business, it’s always good to have a good idea about how much your work worth. I pick a regular batting fabric, big enough for a king size quilt, 20 dollars plus taxes. I got a wide fabric made of 65 % cotton with a printed design in Mexico, cost: 30 dollars. I got in Canada two spools of quilting thread, cost: 8 dollars. I also kept working on this quilt from one to two hours per day, it took me 3 weeks and a half to finish it. 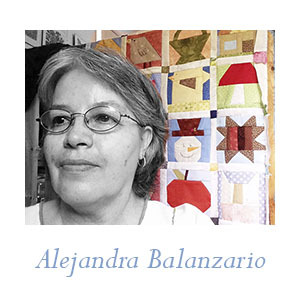 I need to mention here, that every quilt is a piece of art, your piece of art, you can quilt it as much as you want to, the more you work on it, you need to count every hour you put on it. Now I can share with you what I really spent on this quilt. Total $ 1,268.00 Canadian dollars. As you can see with these numbers, to make a quilt has its price, of course I didn’t pay myself for making it, I only had to pay 458 dollars to get all the material to work with. But it’s important to know how much your work worth. If you ever get asked to make a quilt, now you need to add the profit to set a price for a quilt made by you. From any point you look at one quilt, the fabrics, the design, the size, remember it was made by an artist. An artist that put lots of work on it, lots of work hours on it! Quilts are beautiful and they will make any room to look like a unreal room, take care of them and cherish them, each quilt is a treasure by itself and you made it!